You are cordially invited to join the Eyewire community for not one but three weekly power hours! Trace like the wind to win sweet bonuses. After the 2 hours are up, you get an extra 50% of your base score! The top scoring player gets a whole 100% extra! 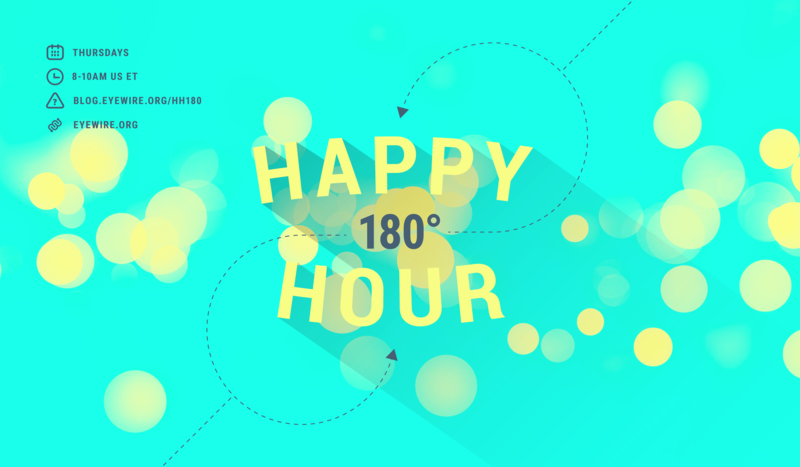 Props to Karyll Catubig and Alex Norton for designing these sweet Happy Hour posters! 2 Responses to "Official Eyewire Happy Hours"
its the busiest computer day, its when most of the work is done. its why it always takes longer to get thru the shopping lines too. Don’t worry, Faun, Happy Hour is staying on Fridays!